PHOTO BY STEVE WILLIAMS Columbian's Cole Zimmerman goes in for a left handed layup against Port Clinton Saturday in Tiffin. Time between wins for Columbian this year has been much longer than desired. That they had to wait a little longer than planned for their latest victory, well, they only had one of their own to blame. Jaden Myers hit two foul shots with no time left in regulation to force overtime in the junior varsity game and followed up with a buzzer-beating putback to send the issue to another extra session. 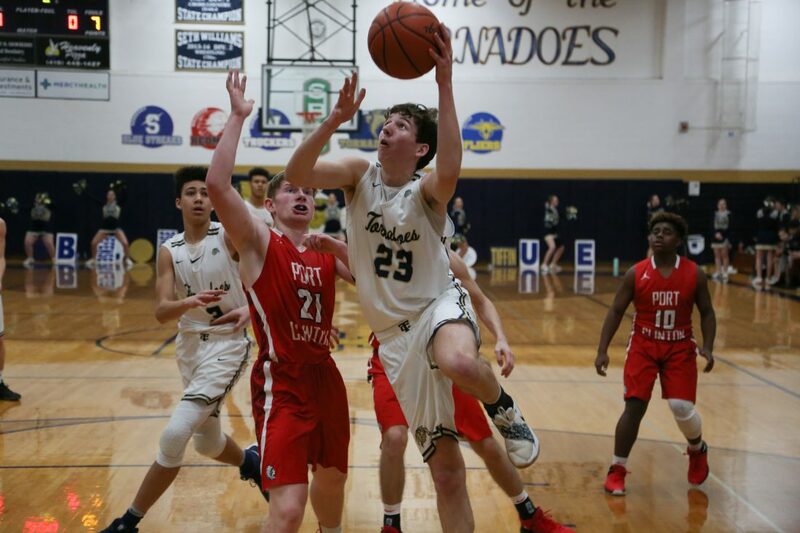 The younger Tornadoes, relatively speaking, came up short, but in the varsity game, Columbian had the upper hand from mid-first quarter on while turning back Port Clinton 63-54 Saturday night. Zimmerman tossed in 11 points and had nine rebounds, one of four Tornadoes to score nine or more in a balanced effort that kept on giving. That was the start to a 17-2 run that extended two minutes into second period as 3-pointers by Burns and Mason Scott pushed the margin to 23-8. Columbian made 24 of 52 for the game, spurred by a combined 12 of 21 in the second and fourth quarters. Zimmerman scored five in a 46-second span early in the third period. And with Burns getting another 3-pointer and Reaves scoring off a Frankhauser feed, Columbian had its biggest lead at 43-26 with 4:22 left in the quarter. From there, the Redskins put together a 12-4 run to trim the margin to 47-38 for the stretch. Sammy Diaz, who led PC with 18 points, hit one of his four 3-pointers in the run and Max Brenner (16 points, five rebounds) added a couple inside baskets. Dylan Simpson’s jumper to start the fourth brought the Redskins to within 47-40 but Reaves, who led Columbian with 22 points and matched Frankhauser’s team-high five assists, had a three-point play to counter. The Tornadoes maintained an eight-to-10-point lead the rest of the way. Reaves scored eight in the fourth quarter, including back-to-back hoops to push the margin to 62-49 with 1:51 left. Kinn said his club has shown marked improvement the past few weeks.